Synopsis: A Father Christmas ornament invites insects and a friendly frog to celebrate Christmas with him. 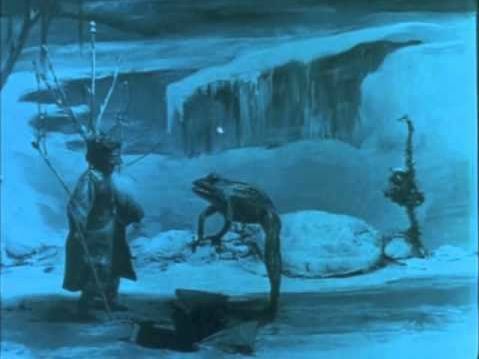 The Insect’s Christmas is another charming stop-motion animation from Wladyslaw Starewicz which, like his earlier The Cameraman’s Revenge, dazzles with invention while leaving us bemused by the amount of care and attention to detail that must have gone into manipulating the various appendages of the dead bugs that make up a large part of the cast. The story sees a Father Christmas ornament climbing down from his perch on the tree one night and venturing into the snowy outside where he conjures another Christmas tree out of thin air. He then invites various insects and a frog to celebrate Christmas with him. Inviting a frog to a bug’s party doesn’t seem to be the wisest move to me, but this particular amphibian must be a vegetarian as he doesn’t appear at all interested in consuming his fellow celebrants. Starewicz certainly had a thing for bugs, but for me it’s the golden-haired doll that’s awoken from her slumbers by Father Christmas disembarking from – and returning to – his Christmas tree which made the biggest impression. Although it clearly wasn’t Starewicz’s intention, there’s something undeniably eerie about animated dolls, and the slow, deliberate movements of this one make it more than a little creepy. Otherwise, The Insect’s Christmas is an enjoyable little animation (it’s only 7 minutes long) which will probably still beguile younger children even today.